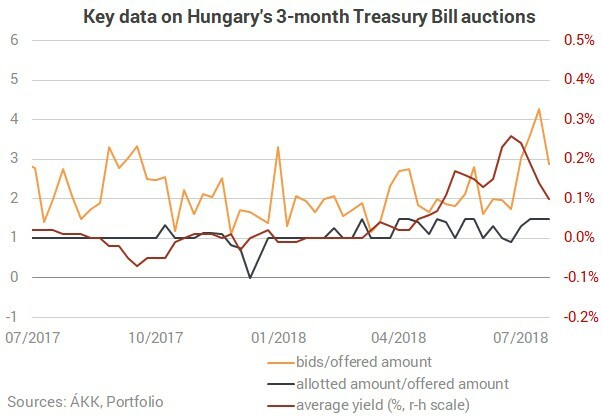 Hungary’s Government Debt Management Agency (ÁKK) allotted 60 billion forints worth of 3-month discount Treasury Bills at its weekly auction on Tuesday instead of the planned HUF 40 bn. The average yield has also dropped further thanks to the heavy demand. The ÁKK has received HUF 114.8 bn worth of bids on a HUF 40 bn lot of 3-m T-bills today, as a response to which the issuer allotted HUF 60 bn of the instrument, using the maximum raise of 50%. The 0.1% average yield is four basis points lower than a week ago and the lowest since early May.